Having a hobby shop so close to me, it is rare that I pick up a retail blaster, but this is one that was actually given to me. As luck would have it, I won Eamus Catuli! 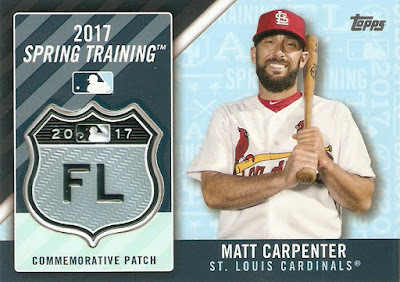 's "Favorite Card of 2016" contest, which was based solely on a randomizer, and my prize was a blaster box of 2017 Topps. Each blaster contains 10 packs of 8 cards, and as always, plenty of inserts and parallels to be found. 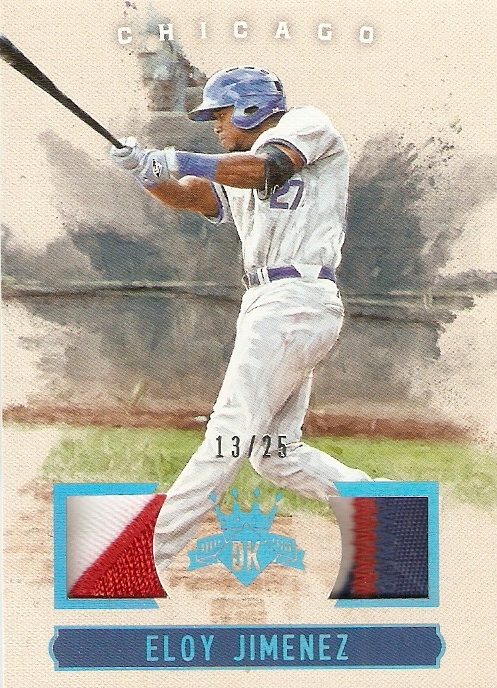 As a bonus, you also get a commemorative Jackie Robinson Day patch card of a current MLB player. As far as the base cards go, I got 5 Cubs, which is pretty awesome. Of these, 2 are regular base cards, 2 are World Series Highlights cards, and 1 is a League Leaders card. In addition to the Patch card, you also get 5 Jackie Robinson Day Tribute cards. Mine were Buster Posey, Paul Goldschmidt, Josh Donaldson, Carlos Correa, and Nolan Arenado. 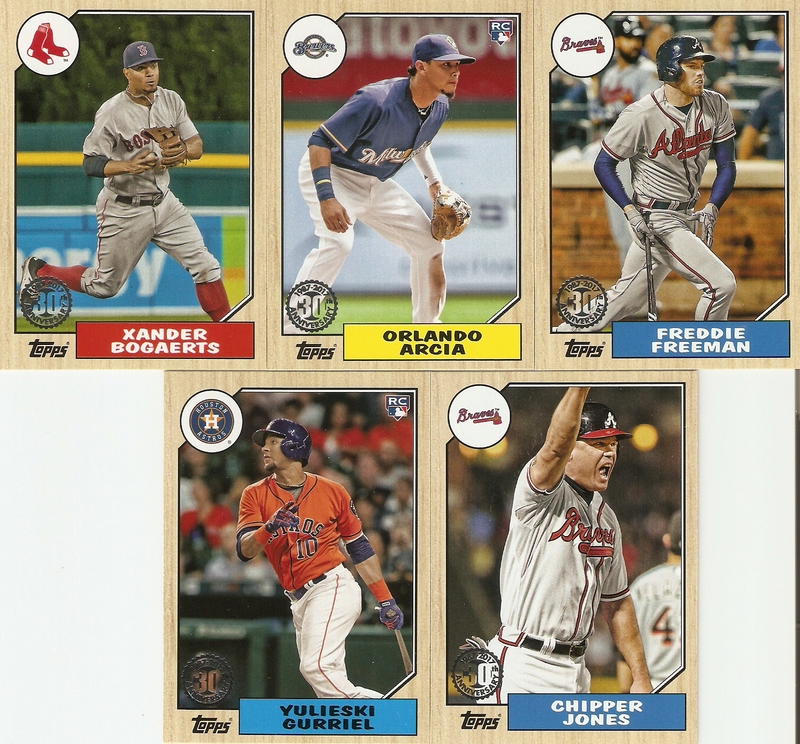 I also got a Father's Day card of Freddie Freeman and a Rookie card of Andrew Benintendi. 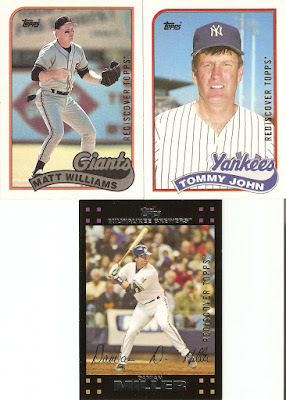 There were three 1987 Topps tribute cards featuring two players who had cards in the original set. 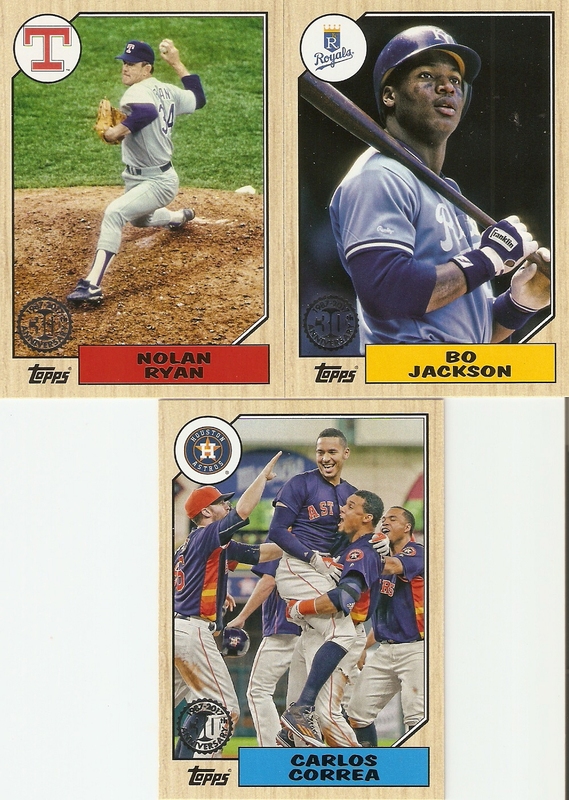 They are different, however, as Nolan Ryan was on the Houston Astros at the time, and Bo Jackson had a Future Stars logo on his. 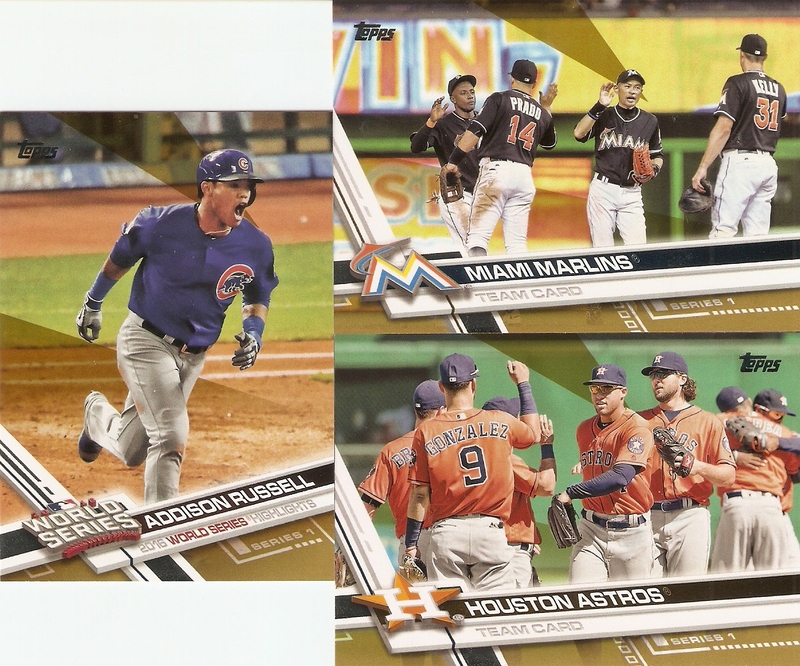 I also really like the Carlos Correa card, with the team celebration depicted. 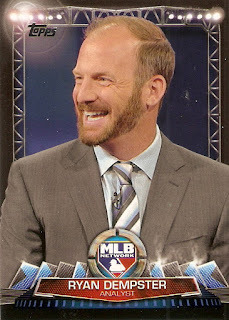 I got one of the Rediscover Topps promo cards. 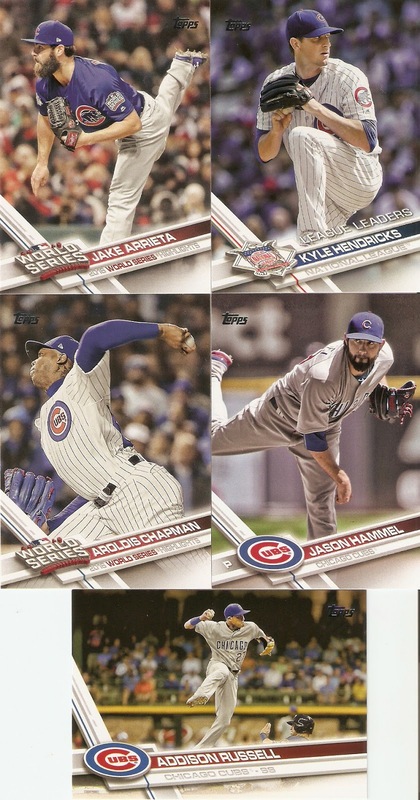 It's basically an add for some of Topps' on-line products, featuring a reprint of an older card on the front. This one is of Jackie Robinson's 1956 Topps card. 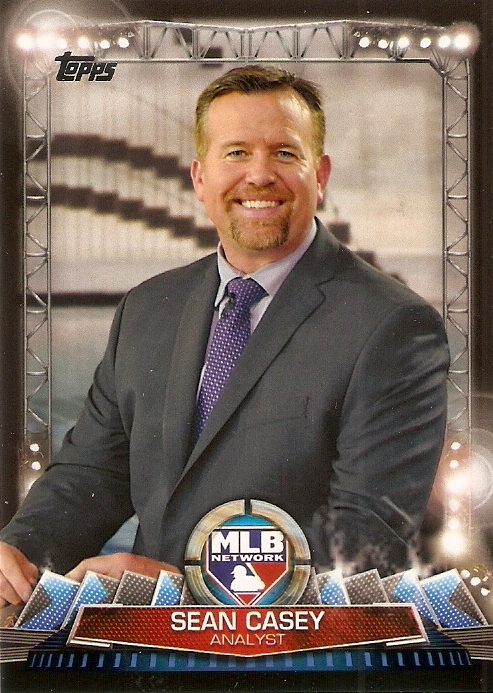 I also got one card from the MLB Network insert set, featuring current broadcaster, and former Cincinnati Reds first baseman Sean Casey. In addition to the Jackie Robinson Day Tribute cards, another retail exclusive is the Award Winners insert set. I pulled Anthony Rizzo (Fielding Award), Mike Trout (MVP), David Ortiz (Hank Aaron Award), and Kenley Jansen (Reliever of the Year). As I mentioned in my Jumbo box post, one of my favorite insert sets is 5 Tool. I just love the inclusion of five photos with the black background. I just think it looks cool. Anyway, I pulled two out of this box, Josh Donaldson and Buster Posey. 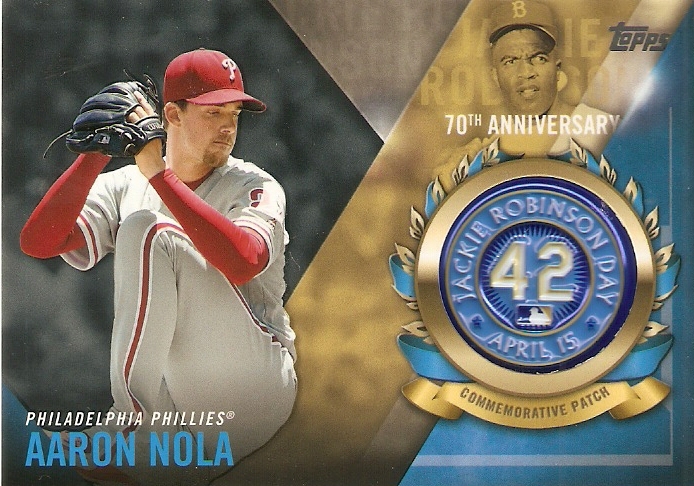 Lastly, my one hit was the included Jackie Robinson Day patch card of Philadelphia Phillies pitcher Aaron Nola. 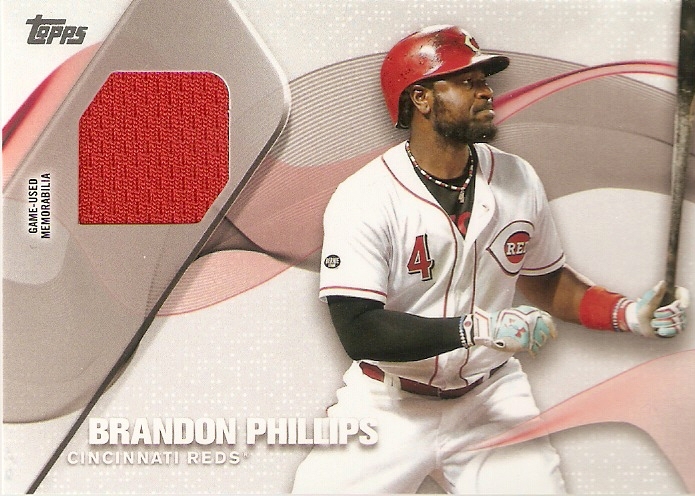 Although these aren't the traditional patch cards made of embroidered fabric, they still look amazing, and the sheen of the textured "patch" makes it look like something special. Well, that's it for this box. Thanks to Tom for sending it to me, and thanks to Random.org for picking me as the winner! It's been over a year since I picked up a box of baseball cards, but something is a bit different this time around. All it took was a World Series win by my favorite team in one of the most memorable seven games of all time for me to return to the baseball collecting world. Now, I can't really say I ever left. What it came down to was simply that I didn't spend as much on cards in general last year as I had before, and when I was able to make a purchase, I usually went in a hockey direction. Well, as a lifelong Chicago Cubs fan, the thrill of last October reinvigorated my love of the National Pastime, as well as my interest in its cardboard. 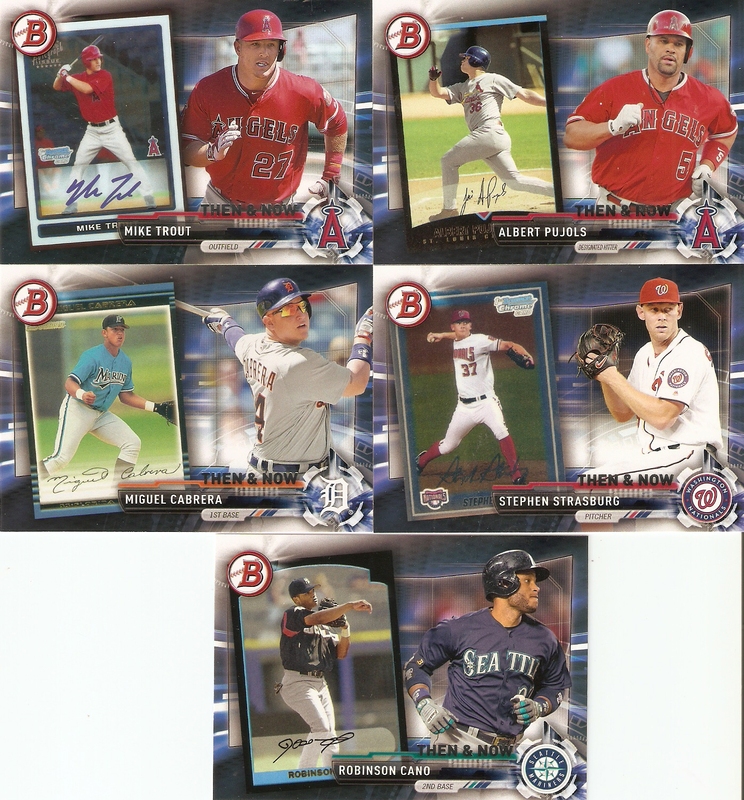 My first baseball purchase of 2017 ended up being the first release of 2017 with Topps Series 1. There are two options here, hobby-wise, a regular 36-card box, and a 10-card jumbo pack box. 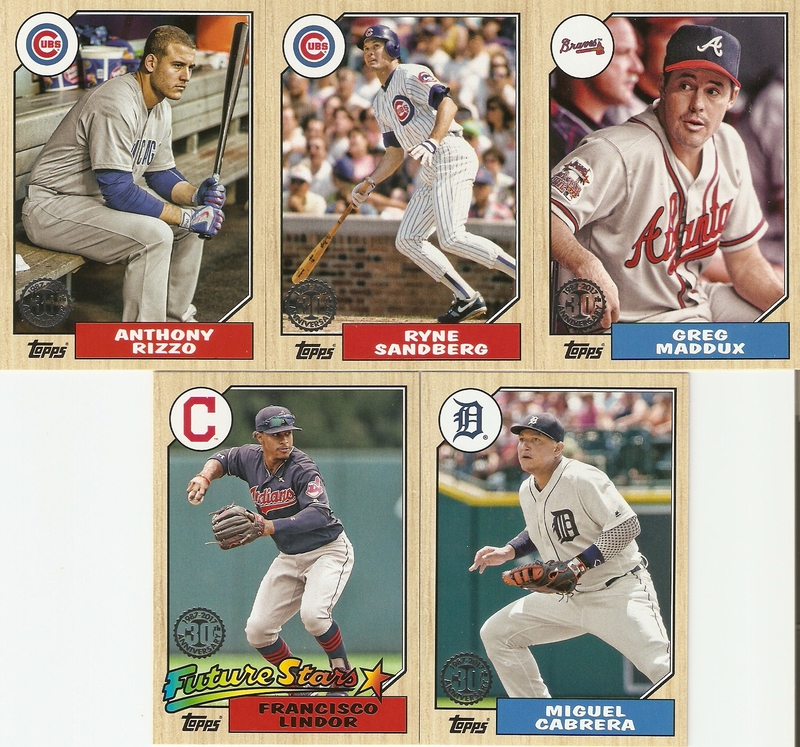 I went with Jumbo, which I always do with Topps, for two reasons. 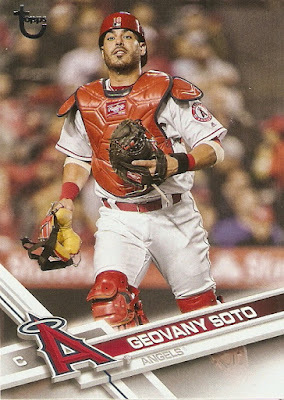 One, you get more hits (3, as opposed to 1), and you end up with a complete 350-card set. 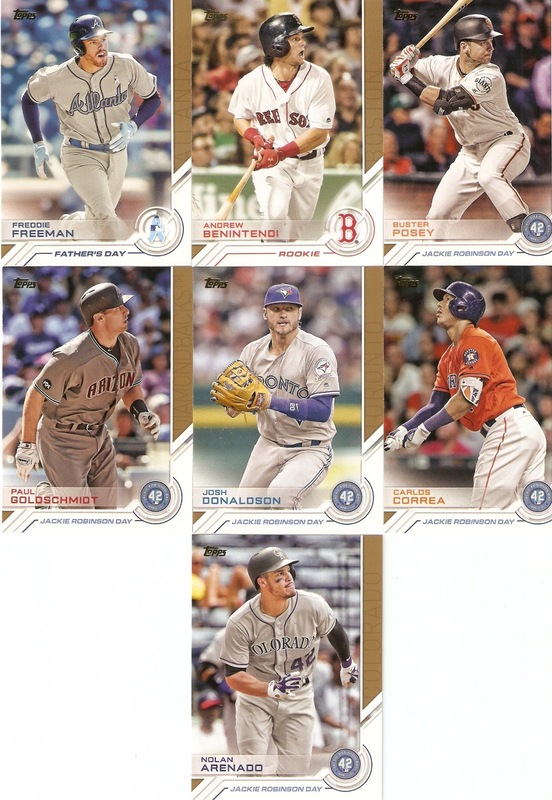 I know that some people like the chase of set-building, and I do too, but I think I'll save that for this year's Allen & Ginter, and (maybe) Heritage. Anyway, each box contains 10 packs of 50 cards. 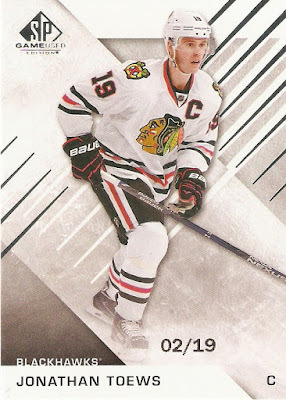 There is also a guarantee of three hits, with one being an autographed card and one being a manufactured patch card. 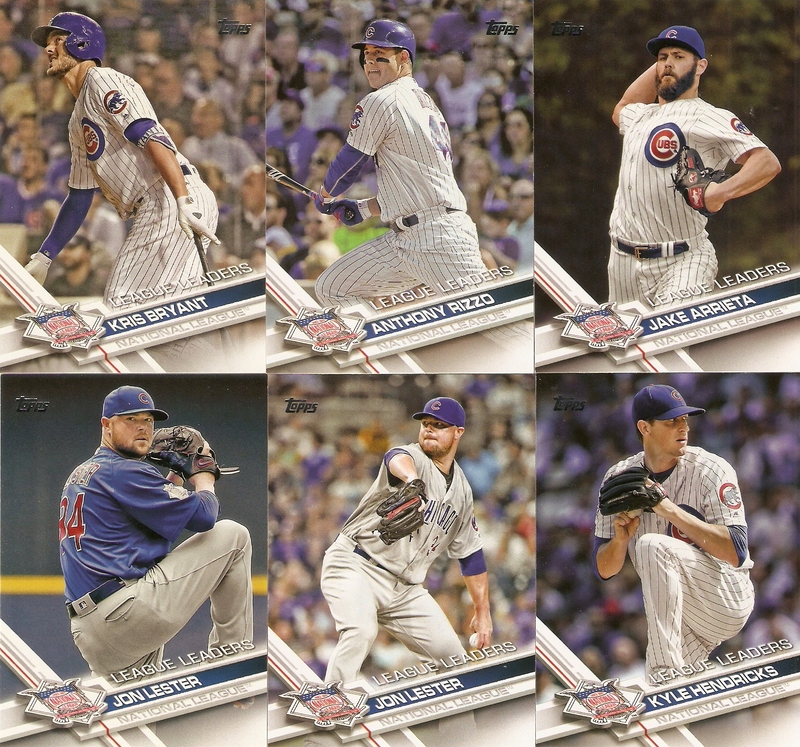 After collating, I did end up with a full 350-card set, and when you factor in league leaders and World Series cards along with the typical base cards, there were a total of 20 Chicago Cubs cards, with plenty more to come in Series 2. My favorite one, by the way, is the World Series Game 7 card. As always, there are lots of parallels, of varying rarity, with each pack containing one. 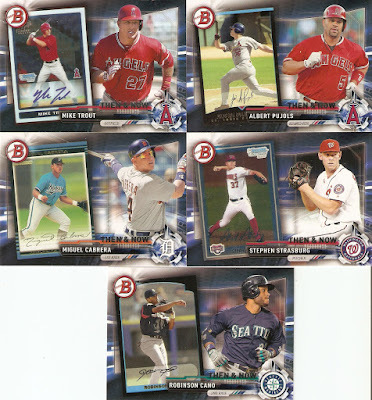 The most common are the Rainbow Foil, which I got five of, including a Kris Bryant League Leaders card. 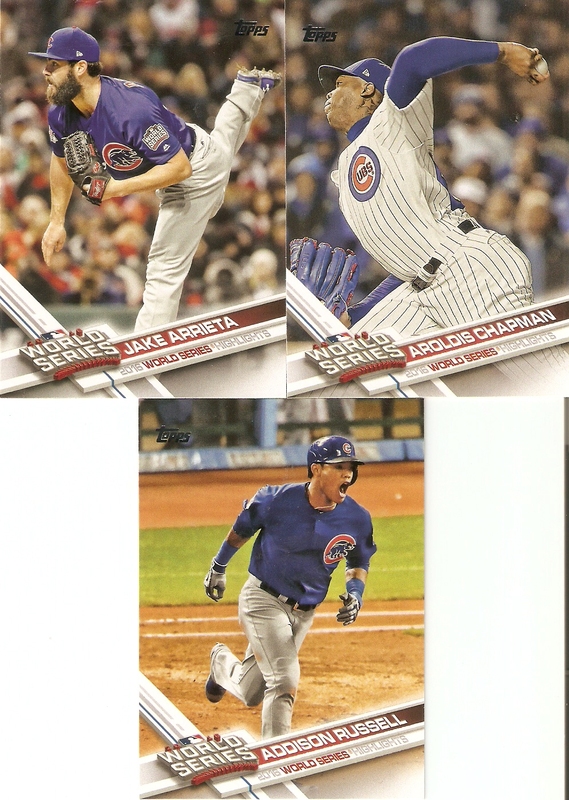 I also pulled three Gold parallels, including an Addison Russell World Series Highlights card. These are all numbered /2017. 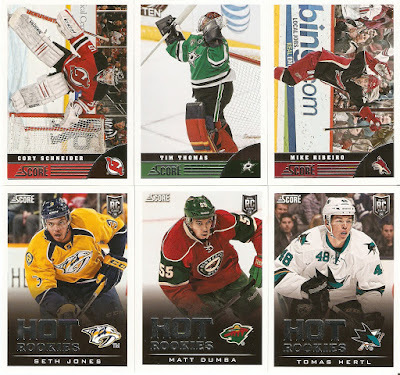 Next is a Vintage Stock parallel. 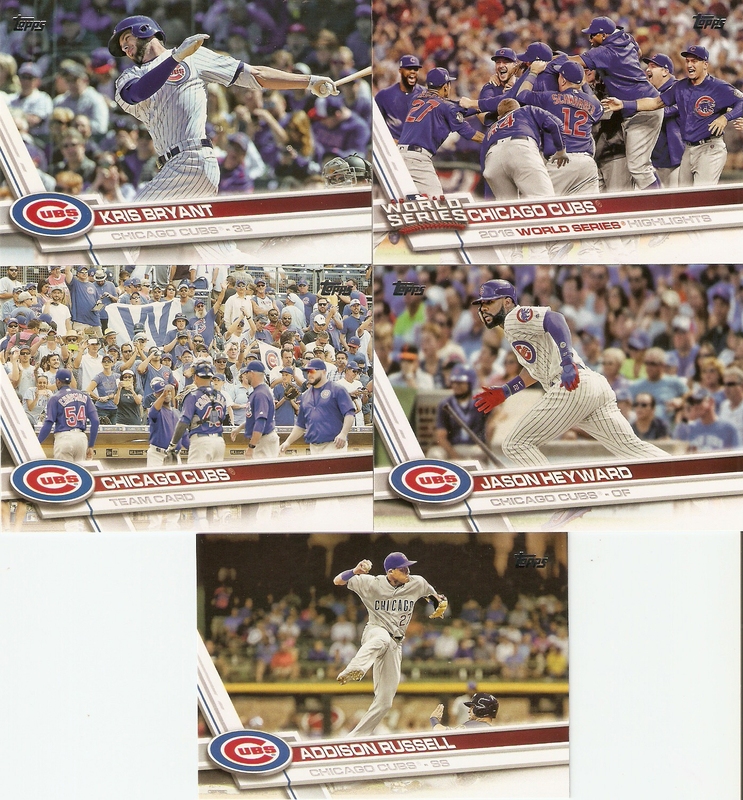 This one of former Cub Geovany Soto is numbered 62/99 and features not only a retro Topps logo, but an older-style non-glossy card stock, which is pretty cool. The rarest parallel that I pulled was of another Cub, Aroldis Chapman, on a World Series Highlights card. This is the black parallel, and is numbered 52/66. 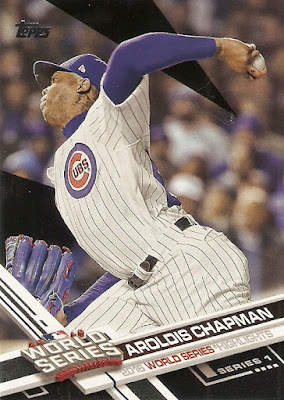 It's a great card to have, as Chapman was an absolute beast throughout the postseason. His only weak point was in Game 7, when he was just too overworked. The ironic thing, is that despite giving up a three-run lead, which allowed the Indians to push Game 7 to a tenth inning, he ended up being credited with the win. Next is a one-per-pack insert set called Salute, which looks at special events (Mother's Day, Father's Day), Throwback Jersey Nights, and also salutes former players. 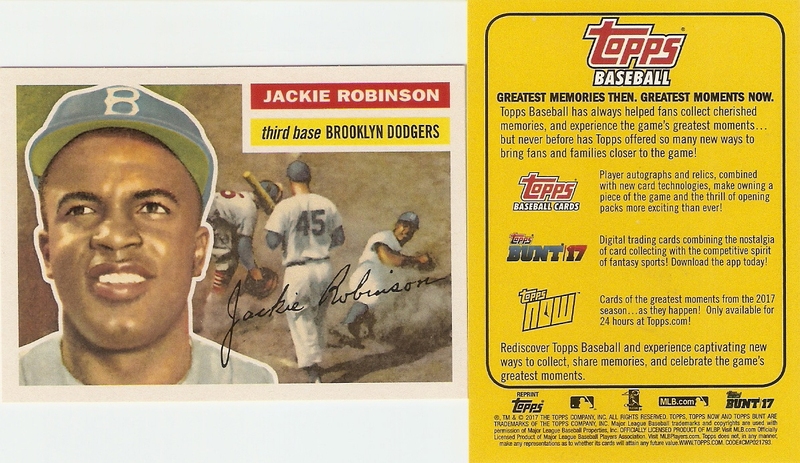 Speaking of "Salute," Topps is saluting the thirtieth anniversary of one of their most iconic releases in 1987. They used the same front and back design, including the older cardstock. They did put gloss on the front of the cards, which is different from back then, and of course, there's the 30th Anniversary foil stamp. 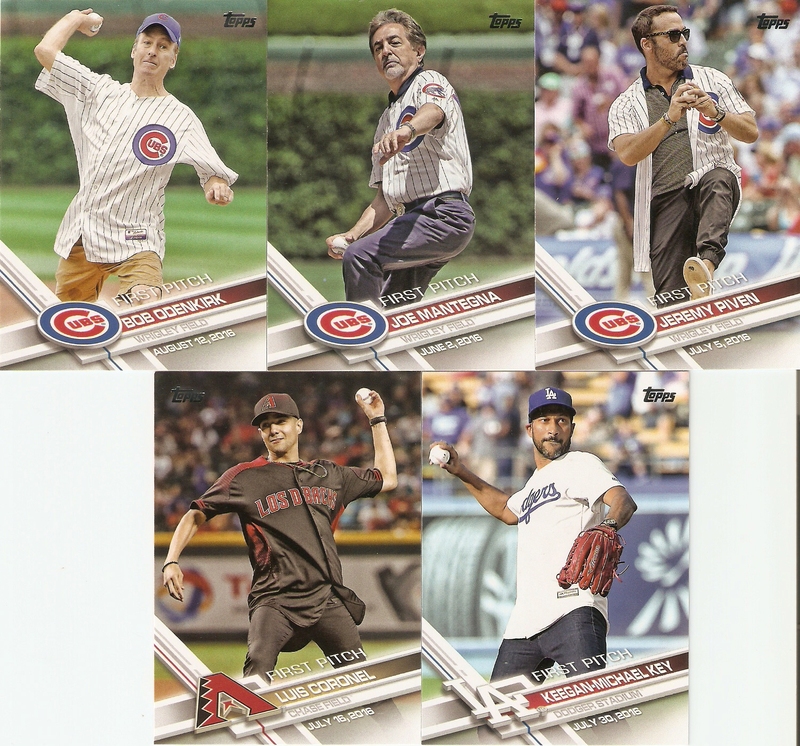 I also pulled five First Pitch cards, which show various celebrities making the ceremonial first pitch at a game last season. The team designation is made for the home team where the pitch was made, and apparently, the Cubs are well-represented. 3-out-of-5 of mine are of pitches thrown at Wrigley Field. Next is a buyback of sorts known as "Rediscover Topps." I guess the idea here is to include cards from older sets, designated with a foil stamp on the side. I can kind of see the point, but if I'm buying Topps baseball cards in the first place, do I really need to "rediscover" them? I pulled one MLB Network card, which is from a 10-card insert set featuring the network's various analysts. Now, many of these are of former baseball players, and it is only fitting that mine is of a former Cub. 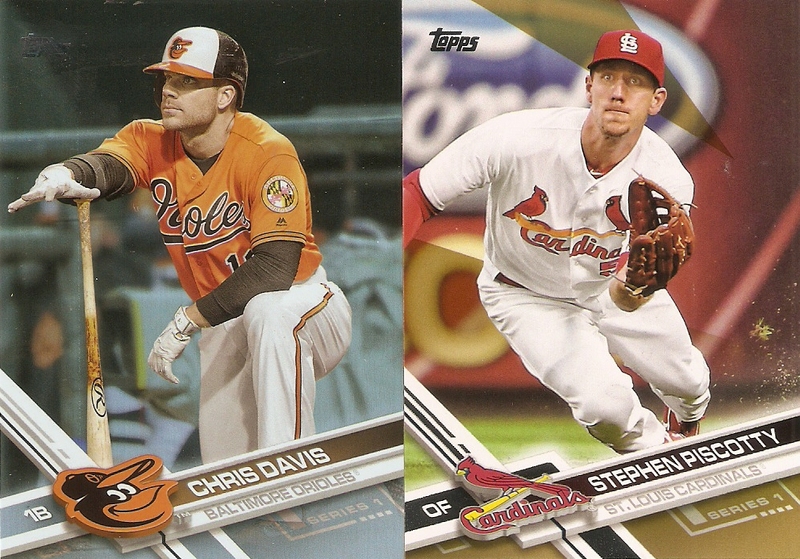 These Rediscover Topps Promo cards, I'm not too sure about. 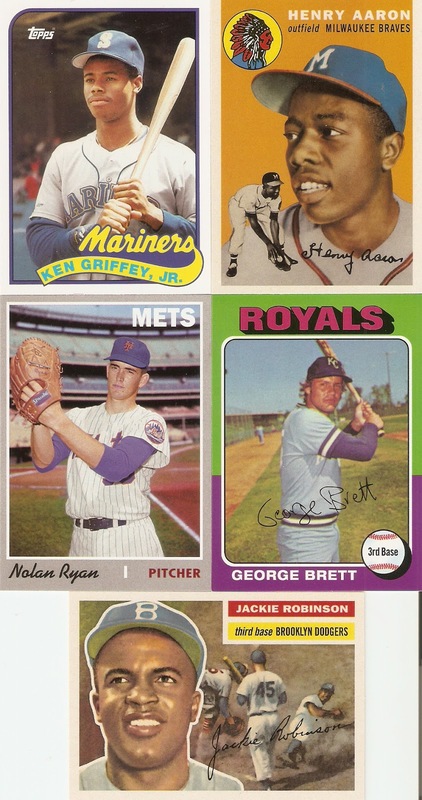 The front features a reprint of a classic Topps baseball card, but the back is an add for the various on-line features that Topps provided, like Topps Now and Topps Bunt. 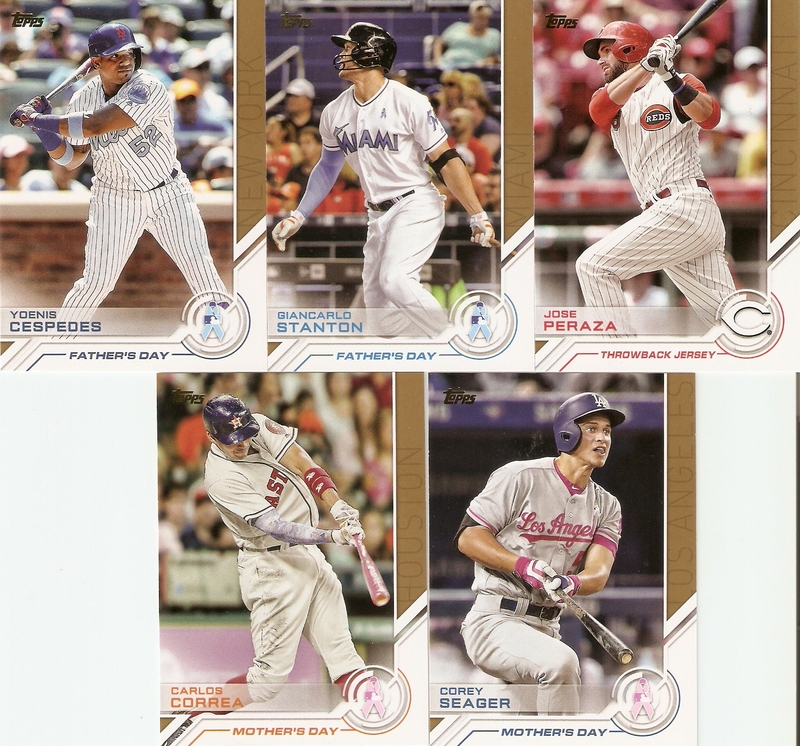 These kind of cross brands, in that they make reference to a current MLB stars' first Bowman cards. I like them quite a lot, actually, and they remind me of the backs of the first few Stadium Club releases in the early '90s, when they would show a player's Topps rookie card next to their stats. 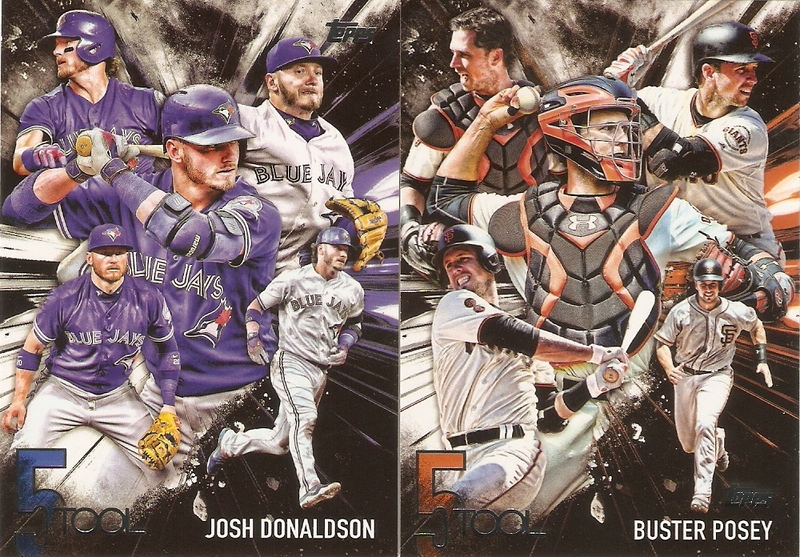 Easily the coolest looking insert set is 5-Tool. 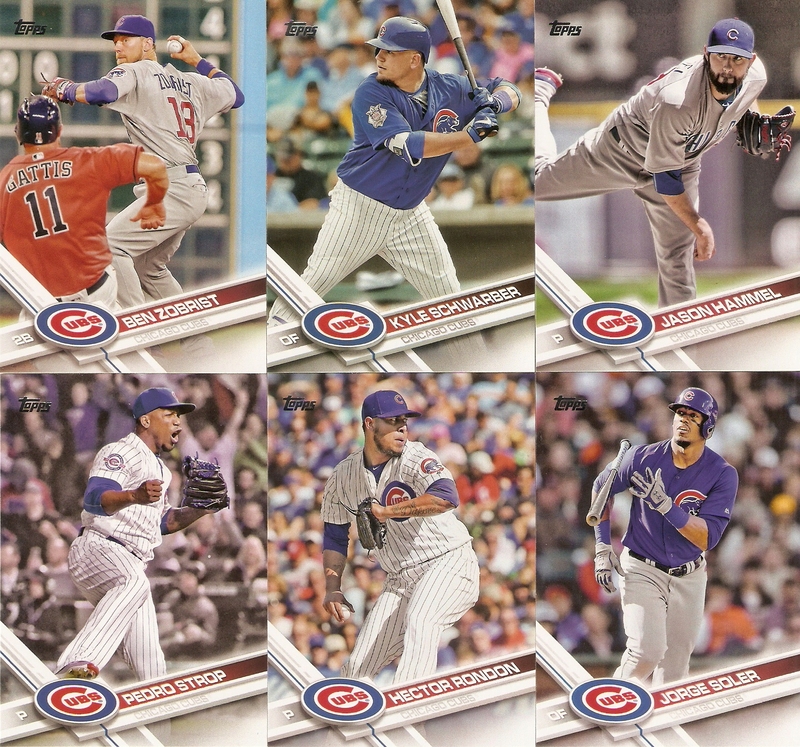 They actually manage to somehow fit five photos of the players on the front of one card, and in a way that's a bit cluttered, but still works. I don't have much else to say about them, other than they look awesome. Now for the hits. The first one is the manufactured one. Boxes will have either a manufactured Spring Training Patch or an All-Star Game medallion. Mine was a Spring Training patch for Matt Carpenter of the St. Louis Cardinals. The patches are different this year, though, in that they no longer are fabric. With the cards, they are using a textured synthetic material, similar to the World Series patch they put on the sides of the Cubs and Indians hats last year during the Series. I also pulled a Brandon Phillips Major League Material jersey card. 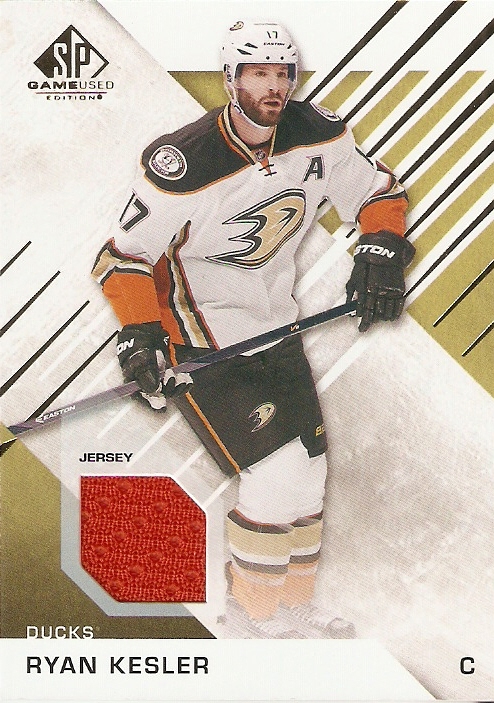 In years past, I know that they took one of the year's inserts and placed a jersey swatch in the same design, but I like how this year, the cards are its own unique thing. Unfortunately for me, though, this card is already out of date, as Phillips was traded to the Atlanta Braes just a couple of days ago. This card, of course, make reference to the 1987 design and features Gene Hackman's character of Norman Dale from the movie Hoosiers. The movie was released in 1986 (not 1987), but I still won't complain about this great of a pull. We get the picture and name of his character from the movie, but I love that he signed his own name. 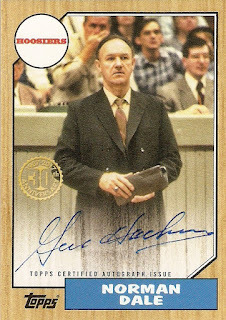 Unlike most people in either the sports or entertainment industries, Hackman had a great and (mostly) legible signature. The card looks fantastic, and has, so far, made it to an easy number one spot on my Top 10 Pulls of 2017. That's it for this box. 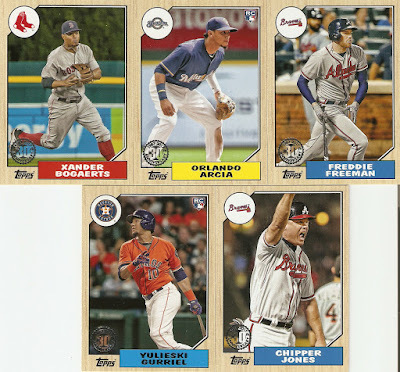 Of course, they won't all yield an amazing hit as the one I pulled, but when you consider that there is a full base set and three hits to go along with it, the jumbo boxes are definitely the way to go with this release. 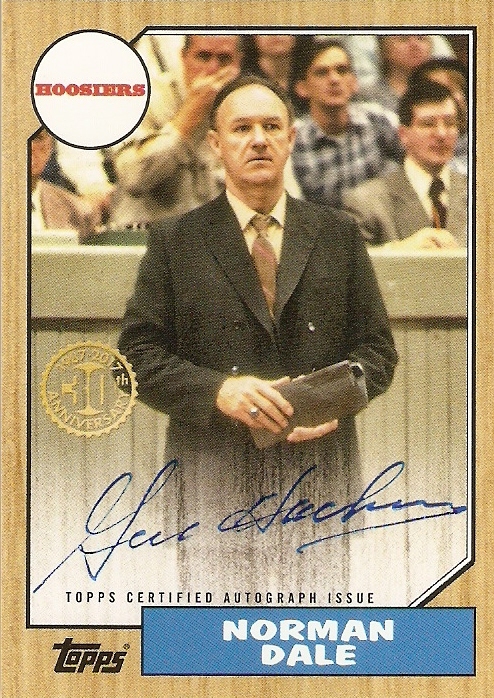 Well, I just completed my first trade in quite a while, with Doug at Sportscards from the Dollar Store. I haven't traded in quite a long time, but this was quite a good one for me, as it is helping me meet some of my major collecting goals. 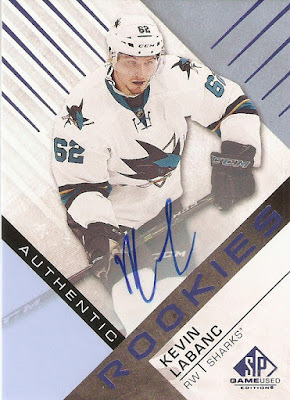 Doug picked up a case of 2013-14 Panini Rookie Anthology, and was able to pull some really good cards at a great price. 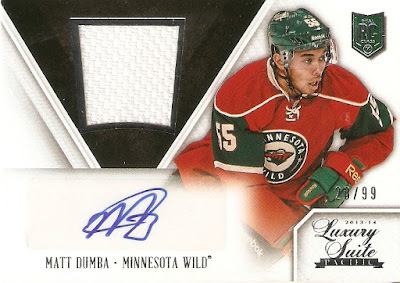 One of the main card that I wanted was this Matt Dumba autographed jersey card from Luxury Suite numbered 28/99. Dumba is one of the best defensemen on a great Minnesota Wild team that is doing some amazing things this year. I already have an autographed puck and a dew cards of his, and I am very happy to add one more. Apart from the Dumba card, I also got 40 cards from the Score Update set. 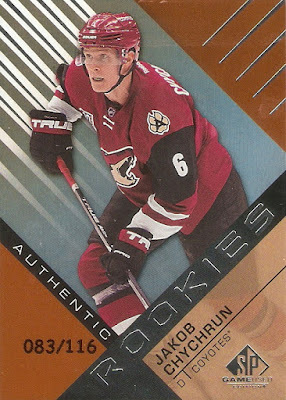 These cards were inserted as inserts in Rookie Anthology to update players who had switched teams during the season and add rookies who made their NHL debut after the original set was produced. 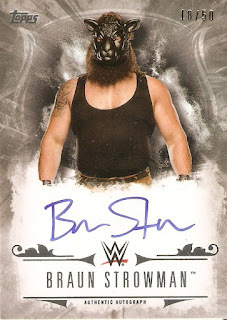 I am working on trying to get as many of these cards autographed as possible, since they look great when signed, so this is a big help, as a full set of update is much hard (and more expensive) to come by. After making this deal, it made me realize how much I miss trading, as it is one of the most fun aspects of this hobby. So if anyone has any interest in my traders, let me know, and we can work out a deal. As always, thanks for the trade, Doug! 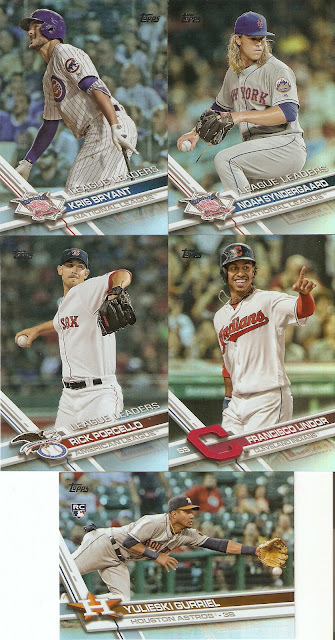 Here's a running tab of the top 10 cards I have been lucky enough to pull from packs during the 2017 calendar year. 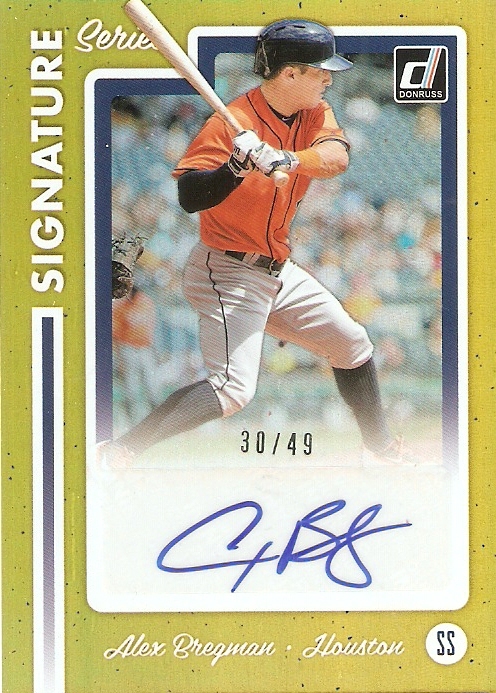 The numbers on the Orange Rainbow Parallels are in reference to a player's draft year (/199 or less). 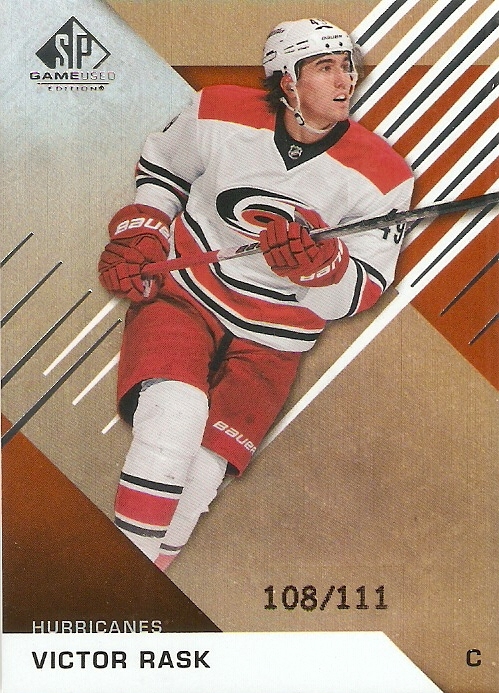 Rask, who was drafted in 2011, has developed into one of the biggest offensive contributors on the Carolina Hurricanes, scoring 13 goals and 19 assists so far this season and is ranked second on the team in total points. Chychrun is the son of former NHLer (and member of the 1992 Stanbley Cup winning Pittsburgh Penguins) Jeff Chychrun, and was selected 16th overall by the Arizona Coyotes in the 2016 draft. He was regarded as one of the top defensemen in the draft last year, and the Coyotes had to make a trade with Detroit in order to make this pick. He is already becoming a big player for Arizona, making the NHL team earlier than expected, and has picked up 3 goals and 8 assists so far this year. I really like the color of this jersey swatch, as Anaheim Ducks sweaters cane make for some great memorabilia cards, especially when it comes to patches. I don't have much to say about Kesler, really, other than to say if you haven't checked out his internet show, "Between Two Zambonis," give it a watch. It's hilarious. 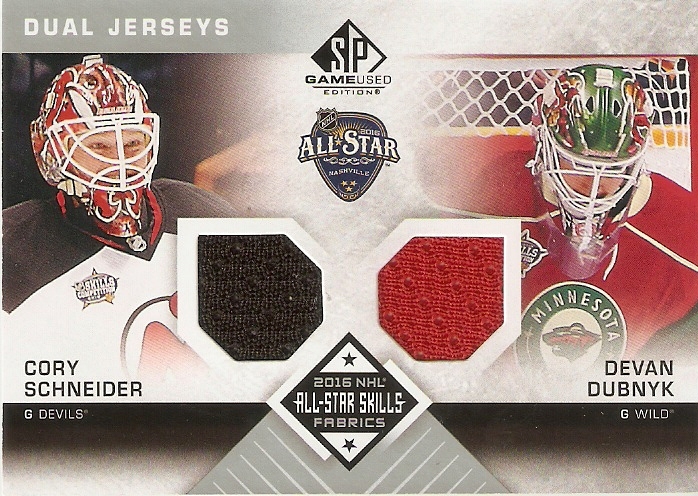 Apart from a larger jersey swatch, the big difference between these and the base jersey cards is the serial number. 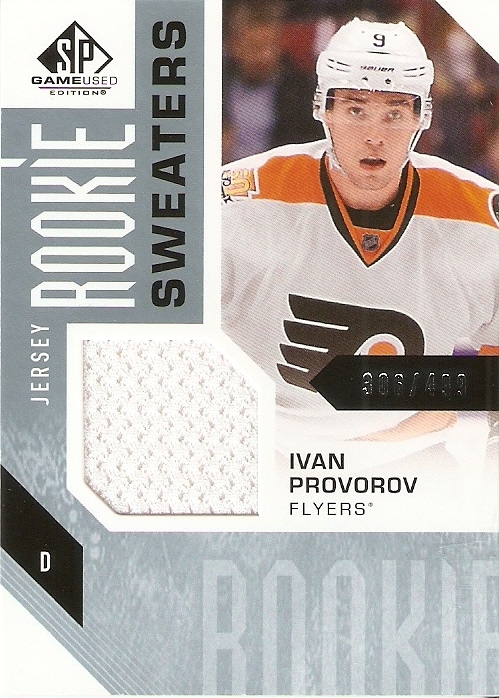 Provorov was drafted seventh overall in 2015, and made his debut this season. He has been making a big impact on the team, scoring 4 goals and 18 assists in 51 games so far this year. These, like a few other hits in SP Game Used, are a variation of the base set. This one, in particular, has a jersey swatch next to his autograph. 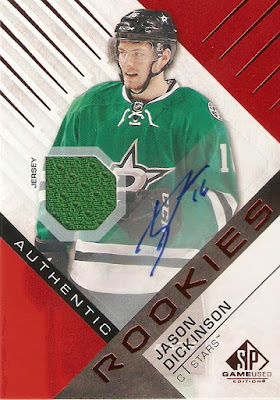 Dickinson has played just two games for Dallas this year, spending most of the season with the Texas Stars of the AHL. Now, this is what a patch card should look like. There is plenty of space for the fabric, and this one, specifically, has so many different colors, with all sorts of stitching and different fabrics. Since it is established that the material was taken from his jersey worn at the All-Star Skills Competition, it is actually the jersey worn in the photo on the front of this card, which I think is pretty cool. That's it for the two boxes. I think I did pretty well, and considering the price of this product compered to others, I'm sure I'll be picking up more in the future. This is the orange parallel, which is numbered to the player's draft year (2013). It's an interesting way to do the serial numbers, as it gives each card a different print run than most of the others. Bigras spent 31 games with the Avalanche last year, but has spent the entire 2016-17 season up to this point with the San Antonio Rampage of the AHL. 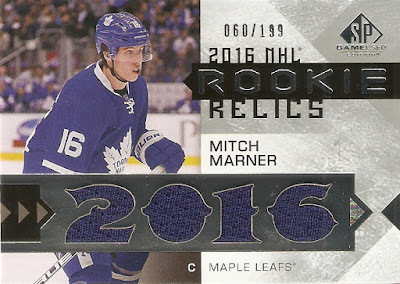 These are your basic memorabilia parallels, where the design is the same as the base card, with a window cut out for the piece of fabric. 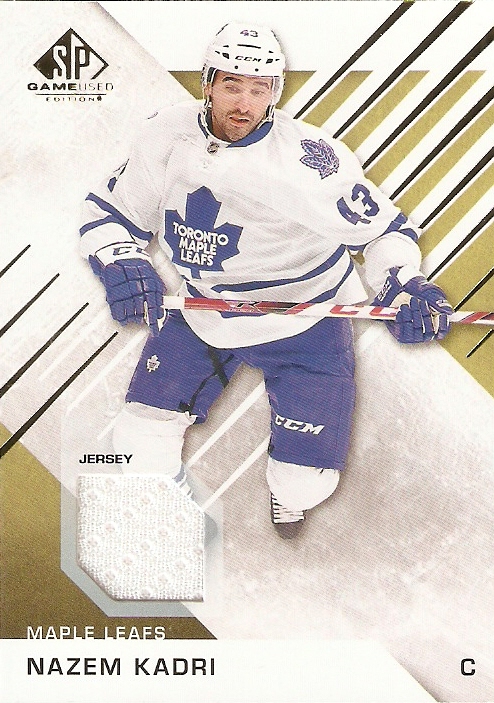 It's a plain white jersey, but Kadri isn't a bad player to pull, as Kadri is having quite possibly the best season of his career, and a big part of what many hope is a Maple Leafs return to greatness. 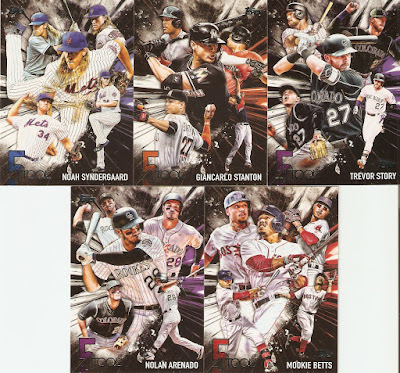 Like the jersey cards, these are very similar to the base cards, except for the (sticker) autograph. 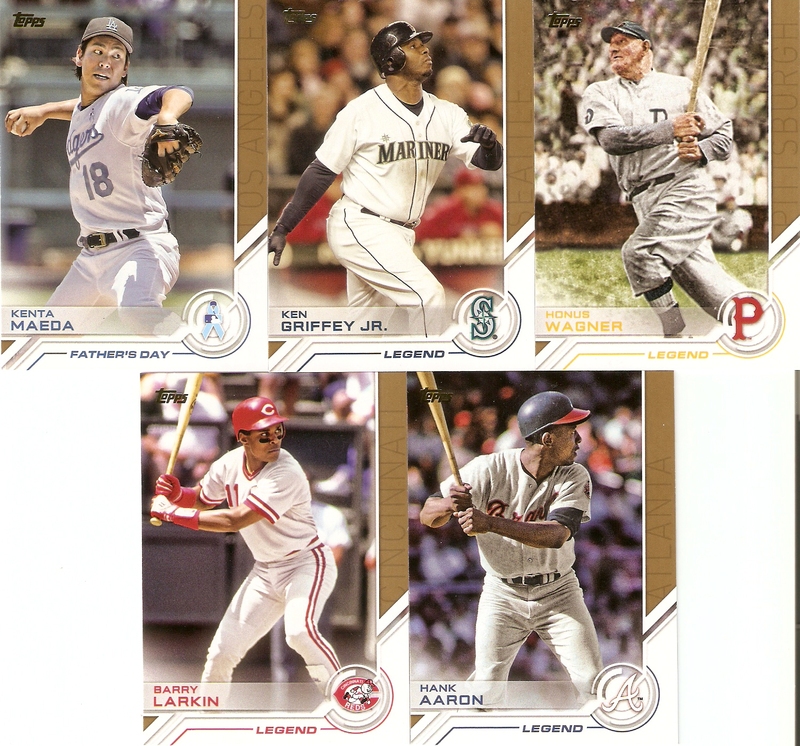 They aren't numbered, but do have varying degrees of rarity, ranging from group A (1:3,436) to group F (1:10). Labanc has spent most of the 2016-17 season with the San Jose Sharks, scoring 7 goals and 7 assists in 38 games. 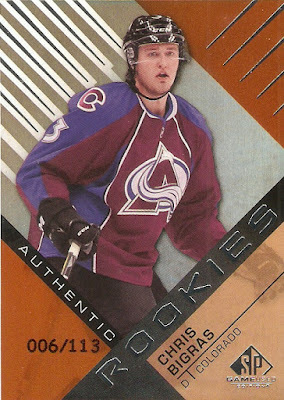 While many cards nowadays has as vague as possible of a guarantee when it comes to the jerseys, this one is different. Instead of a simple, "we promise this was worn by a player at some point," Upper Deck actually put the very jerseys worn by the players in the All-Star Game Skills Competition, so you know exactly when and where it was worn. 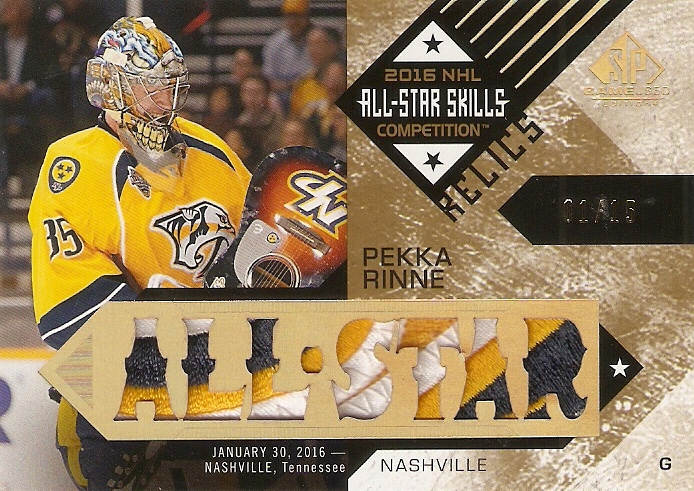 I always like the die-cut windows when it comes to memorabilia cards. 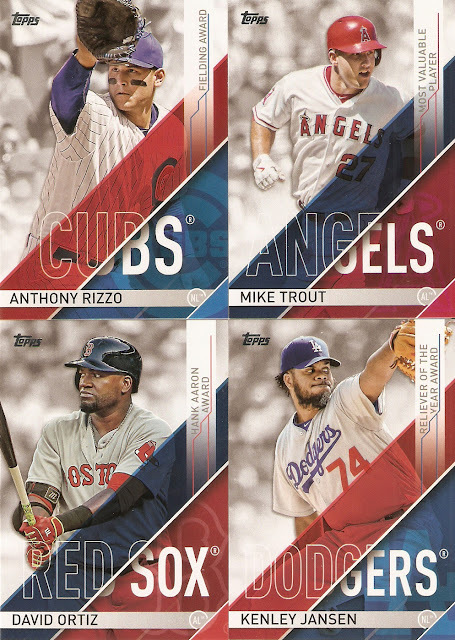 I always thought it was cool, since I first saw what Topps was doing with Triple Threads, then Panini did it for a few years with Prime. Here we have the "2016" cut out to signify Mitch Marner's rookie season. 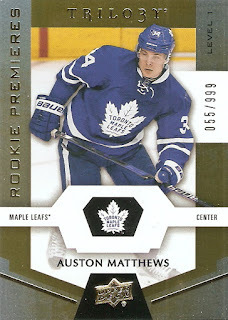 It's not only a great-looking cards, but a great card of one of the NHL's hottest young rookies. Believe it or not, the best cards out of this box is actually a base card! 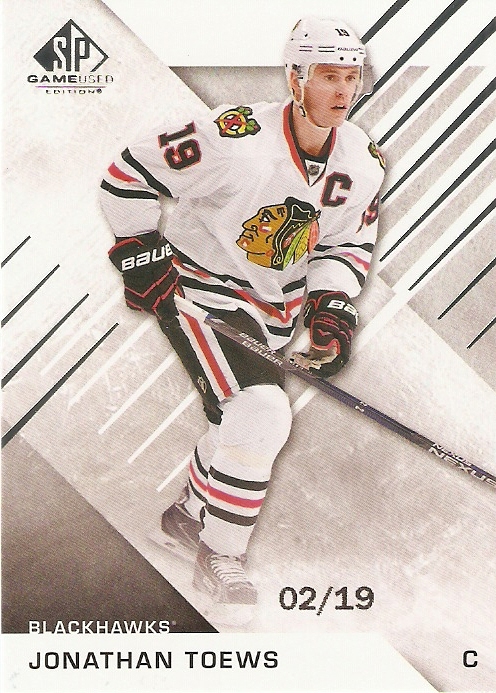 The interesting thing about what Upper Deck is doing with SP Game Used, is that all base cards and base rookie cards are numbered to a player's jersey number (/19 in the case of Toews). 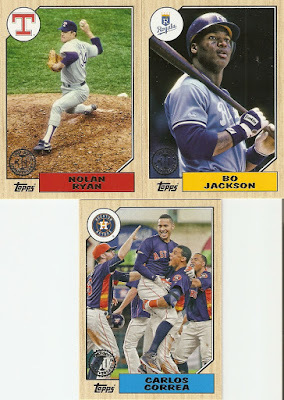 Not only that, but parallels are also specially numbered to a player with Orange Rainbow making reference to the draft year (/199 or less) and Ranbow parallels making reference to the player's age (/256 or less). It's the one product where the base card is the one you want to find.